MEDICINE HAT, Alberta – Mark Rassell buried two goals and Michael Bullion’s final save of 30 came with 7.2 seconds left to help the Medicine Hat Tigers sneak by the Everett Silvertips, 5-4 before a crowd of 3,247 at Canalta Centre on Wednesday night in WHL action. 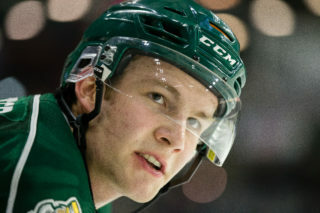 The Silvertips nearly rallied from a trio of two-goal deficits and were led by Matt Fonteyne’s third star effort with a goal and an assist. 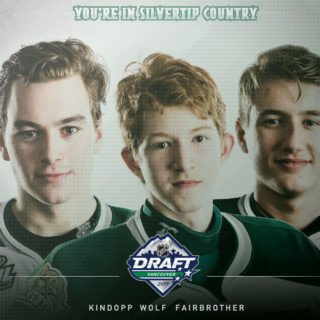 Kevin Davis returned from illness to post an assist, while the Silvertips broke their power play slump on a Patrick Bajkov second period goal. David Quenneville and Dawson Heathcote (1st in WHL career) scored on the Tigers first pair of shots just 29 seconds apart for a 2-0 lead by the time 2:02 had elapsed, summoning Dorrin Luding to replace starter Kyle Dumba. With the Silvertips chipping away after several minutes and building on a penalty kill, Matt Fonteyne stashed a rebound over Michael Bullion’s left pad for a one goal deficit with 13 seconds to play. But on the next shift, Tyler Preziuso converted Ryan Jevne’s pass from behind the net for a 3-1 edge with 1.8 seconds left. The Tips refused to break, closing the deficit to 3-2 on Patrick Bajkov’s slap shot from the right circle, set up by Kevin Davis at 9:58 of the second period. Mark Rassell restored the two-goal cushion at 12:27 on a snapper from between the circles, set up by Gary Haden, but Brandson Hein’s first goal of the season drew the Tips to within 4-3 with 6:10 to play in the second period on a wrap-around bid. Rassell boosted Medicine Hat to a 5-3 cushion at 4:56 of the third period on a backdoor power play goal, set up by David Quenneville’s feed from the right circle. But Montana Onyebuchi responded for the Silvertips when he snuck his first goal of the season on a low shot from the right point with 5:34 to play in regulation. 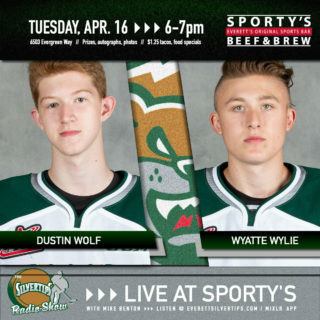 The Silvertips pulled Luding for the sixth attacker with less than 1:30 to play and earned their best look with 7.2 seconds left, when Bajkov fed Matt Fonteyne at the net. But Fonteyne’s turnaround bid at the right post, with Bullion scrambling, was caught in the goaltender’s leg pads to keep the Tips down by a goal. Dorrin Luding turned in 28 saves. The Tips take on the Lethbridge Hurricanes on Friday, 6 p.m. at Enmax Centre (1520 AM / FM 95.3 / Tips App). 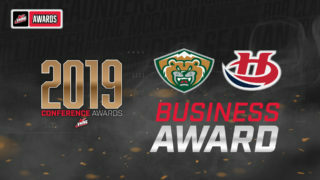 They return home Wednesday, Oct. 18 vs. Tri-City at 7:05 p.m. Tickets are available at www.everettsilvertips.com/tickets. 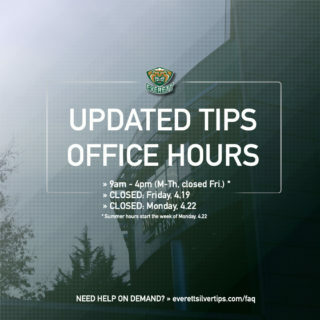 NOTES: The Silvertips scratches included Mark Liwiski (healthy), Pavel Azhgirei (healthy), Martin Fasko-Rudas (healthy), Carter Hart (illness, week-to-week), and Dustin Wolf (lower body, 3-5 weeks) … Davis has 38 points in his last 42 games, stretching into last season … Kyle Walker made his WHL debut as one of seven Tips defensemen who suited up for the game.